Learn more about the Flir C2-NIST 72001-0101 with key features, pricing info, and frequently asked questions. The Flir C2-NIST 72001-0101-NIST Professional Thermal Camera is a pocket-sized thermal camera with internal memory. The small camera can see and capture heat that is invisible to the human eye. Affordable MSRP to fit anyone’s tool budget. Pros: Compact. Affordable. Easy to use. Cons: No Wi-Fi connectivity. Limited battery life. Bottomline: The C2 is one of Flir's more affordable options, but it still works well as a convenient thermal imaging device with basic features. 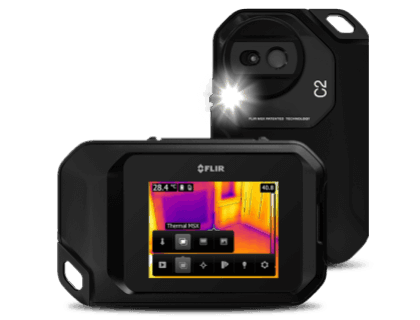 The Flir C2-NIST costs $799.99. Power supply/charger with EU, UK, US, CN & Australian plugs. USB memory stick with documentation. Does the Flir C2 have a flash function? The Flir C2 camera has a built-in light that you can use as a camera flash and as a spotlight for clearer viewing when you are panning over an area. How do I adjust/focus the camera? The Flir C2-NIST has an auto-focus feature, meaning that it will automatically adjust and refocus when you point it at something. How long does it take to recharge the Flir C2's battery? It takes approximately 1.5 hours to fully recharge the camera's battery. Are there any Flir C2-NIST 72001-0101-NIST alternatives? Flir TG167 Spot Thermal Camera. 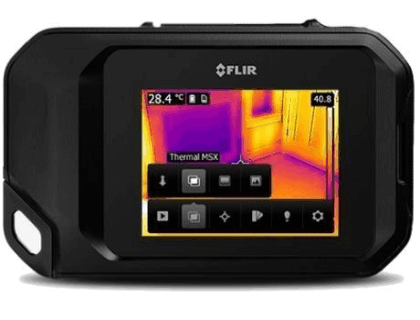 Flir E6 Thermal Imaging IR Camera with Wi-Fi Reviews.